/FAQ /How do I limit the number of characters in my text question? You can set a maximum number of characters on both “Textfield” and “Textarea” question types. To activate this option simply go into the settings for the question and make sure that the “Limit number of characters” toggle is turned on. When this option is active, the user will see a counter on the bottom right corner of the question. 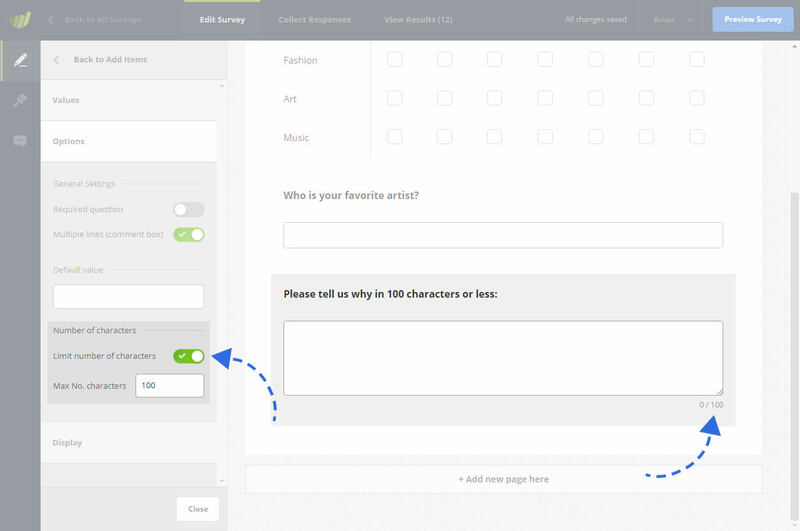 This will update live as the user types, providing some feedback to show how many characters are still available. The number input directly below the toggle will allow you to change the number of maximum characters you would like to apply. The user will not be able to submit more characters than the number you have set. When setting your maximum number, remember that this will be for the total number of individual characters and not the number of full words.